Your boathouse has to meet certain requirements. 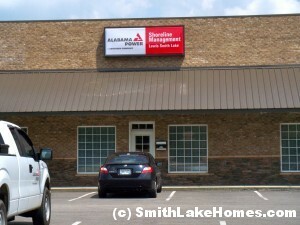 Alabama Power Shoreline Permitting Department sets and enforces the rules for your Smith Lake boathouse. Here are the rules and regulations for permitting your boathouse at Lewis Smith Lake. All of their information is on this sheet. If you want to visit them in person, Alabama Power Shoreline management has an office in Curry which is between the cities of Arley and Jasper on Curry Hwy (Hwy 257) in the southeastern part of the lake. I have provided a map below. They are located in a small strip mall with Curry Discount Pharmacy and Emmy’s Nails. Have to ask Alabama Power. Maybe. Question if I bought a floating dock kit which is a 4’x16′ cedar planks with aluminum frame BUT it requires plastic 55 gal drums. Can and will this qualify to float on Smith Lake on private property ? I am trying to buy a home at 45 County Rd 312, Cullman and currently has a swim platform only. Would it be feasible to add a boat house one slip? Also it supposedly only has seasonal water. Where can I get pics of what it looks like in winter and could year round water be achieved by extending the ramp? Thank you so much! Just what I was looking for! Thanks!